For a safe and healthy summer in your own backyard oasis, take these steps before you take the plunge. 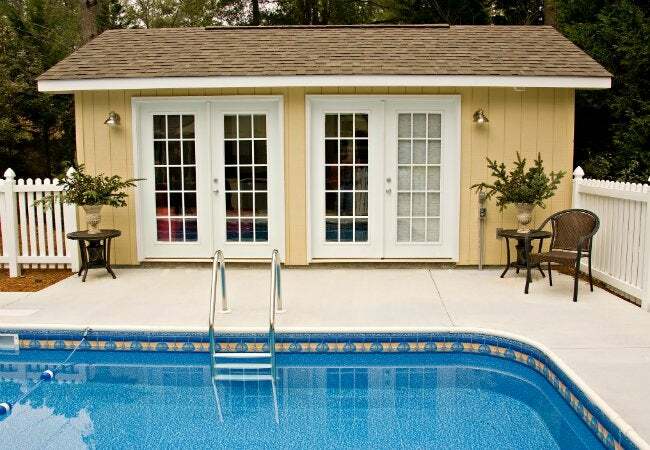 Nothing says summer like a refreshing swim in the backyard pool. But your swimming pool does need care—and doses of the proper chemicals—to ensure safe, delightful dips. It’s important to address all the additives that make their way into the water every time someone submerges, not to mention the problems of plant life that blows in. 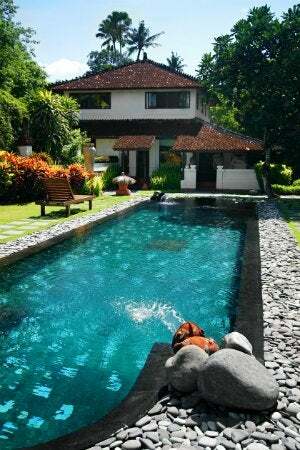 The key is to establish a regular maintenance routine that limits the time you spend prepping the pool so you can spend more time enjoying it. Last one in is a rotten egg! Everyone likes to be laidback in the summer, but properly balancing your swimming pool’s levels is one piece of maintenance that’s essential to keeping swimmers’ skin and eyes from getting irritated. So it’s crucial to follow your pool kit’s instructions to the letter each time you treat your water. Striking a proper balance of pH, overall alkalinity, and calcium also keeps metals from corroding and plaster from degrading over time and prevents the formation of scale, which makes water cloudy, stains surfaces, and can even clog your filter if left unchecked. While there are chlorine alternatives on the market, none are as effective or inexpensive as the real thing when it comes to killing bacteria to keep us safe. The chemical works by destroying enzymes, structures, and processes of potentially nasty microorganisms. But you do have options when it comes to how you chlorinate. Do a little research to decide if you’d prefer tabs or liquid, and whether you want an all-in- one option that includes algaecide or you’d rather handle the green gunk separately. DO GIVE IT A SHOCK. Most pool specialists recommend “shocking”—essentially, applying three to five times the normal amount of chlorine—at least twice a month, and many would prescribe weekly shocks for swimming pools that see a lot of use. Shock product comes in either granular or liquid form from your swimming pool supply store. For liquid, use 3.5 quarts for every 10,000 gallons of water; for granular, use one pound for every 10,000 gallons. The great thing is, some shock products work so quickly, they render a pool swimmable again in as few as 15 minutes. Pool pro tip: Even if you use bromine instead of chlorine on a day-to- day basis, you’ll still need to shock with chlorine. For best results, wait until the sun goes down so that UV rays won’t interfere with the process. Microscopic plant life can make its way into your pool and quickly bloom to the point of making swimmers avoid the water entirely. The goal in using an algaecide is to kill all existing algae and prevent anything from returning. It’s particularly useful in windy and rainy climates, since these conditions foster algae growth by sweeping those pesky spores straight into your pool. Generally speaking, a weekly or biweekly algaecide treatment should keep those blooms at bay. 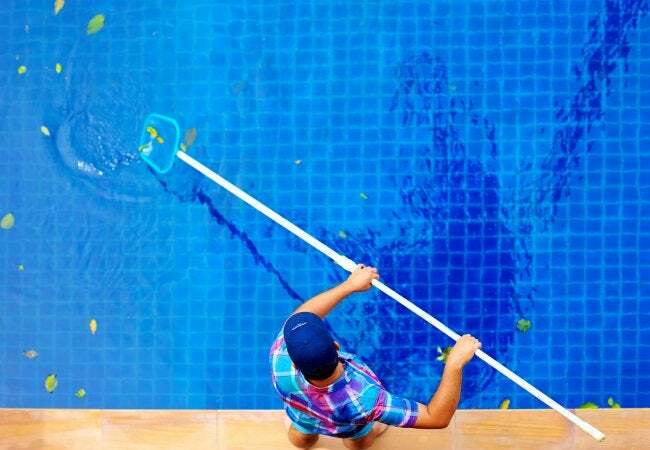 To keep a pool sparkling clean, steer clear of common missteps that would undo your copious maintenance efforts. Direct the garden hose away from the pool when banishing poolside dirt—otherwise, you’re just creating more work for yourself (and your filter). And since rainwater welcomes algae infestation, cover the pool when you’re in for a spate of storms. Here’s a rule of thumb every pool owner should live by: Always add chemicals to water, and never add water to chemicals. It’s a dictate of chemistry 101 that keeps you from accidentally causing an explosion when attempting to rinse out your old pool chemical containers. Be sure to dispose of them properly instead of putting your safety at risk. All in all, it does take a bit of work to keep a pool in shape, but it’s well worth it—whether you’re up for a game of Marco Polo or just want to lie on a float!